One of the best features: the emails are simple but they get into the inbox instead of going to "Promotions" or "Spam" or else. Mission accomplished! It is very user-friendly and doesn't take much time to understand how everything works. It is very intuitive. Reports are great - both visually and data-wise. 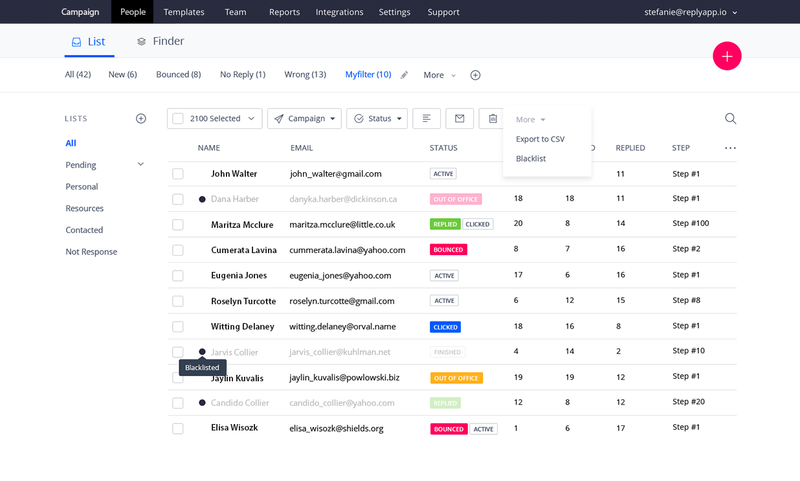 You can see information and analytics for your own campaigns as well as the team performance. We love templates and the ability to create a template for the team within minutes. There's not much editing options in terms of the email design, but it's not really a con since it allows the emails to get through picky Gmail and other email providers' filters. I generally receive a reply in no time at all and found not only the support org. but the sales team to be extremely helpful. Additionally I found a great onboarding process with plenty of resources to consume. Reply.io has been a lot more effective than MailChimp in terms of the follow-ups for the email chains. We use them to contact the people who said they wanted to do business with us and MailChimp's emails usually went to Promotions on Gmail. With Reply.io, we overcame this problem and the open rate improved 30%.